The new proposed location of the public safety complex across from Library Square gets the dander up. 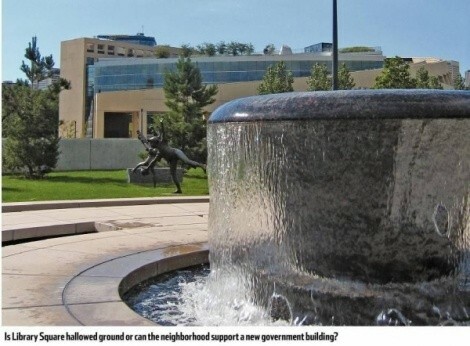 With the announcement that Salt Lake City Mayor Ralph Becker’s much-ballyhooed public-safety complex would not be dumped on the northeast corner of Library Square, a collective sigh could be heard from an irate mob of citizens. For most, so long as the towering symbol of authority wasn’t casting a direct shadow over the Library Square, townspeople could claim victory— even with the more-recent proposal to locate the complex a stone’s throw away from the square, on the east side of 300 East. A few holdouts, however, still aren’t celebrating. A few critics still worry that the complex, which will include headquarters for local police and fire departments as well as an emergency operations center, will sink any prospects for revitalizing the neighborhood with attractive mixed-use retail shops and transit-orientated housing. But, where some detractors see the public-safety complex as being the kiss of death for the neighborhood, others, including the mayor’s office, have promised to use the opportunity to give the district the boost it needs to become a fullfledged neighborhood of distinction. Citizen Gerald McDonough has been following the neighborhood’s planning process since the library was first constructed, and worries the complex will drag down the neighborhood. McDonough also wonders how the city will alleviate traffic and congestion in the area, referencing a May 29 letter the library board had submitted to Becker’s office in opposition to the initial site proposed for the Library Square complex. The letter noted the continued growth of library visitors, citing a 12 percent increase in the library’s visitors over the previous year. “The Leonardo Center will open in 2010, adding significantly more traffic to the block. Parking could quickly become problematic, as the number of underground parking stalls is limited and metered parking spaces would be reduced by more than 70 on Third East alone,” writes the library’s board of directors. The library board has since endorsed the new site for the complex across the street. When asked if the board felt concerns about traffic and congestion on the block would be resolved with the new site, board spokesman Andrew Shaw says the board would not comment. On July 14, the Salt Lake City Council unanimously approved a $125 million public-safety bond for the November ballot. The approval was contingent upon commitments from council-members as well as the mayor’s office that efforts be made to address the concerns of critics like Anderson and McDonough. "We can really accomodate a good mix of uses on the property the city would be using," Becker says of the new site. "And not only for the promised [public safety complex] but to include other uses like residential and event space and open space." Becker says the city will be holding public forums to discuss optimizing the space around the complex. He doesn´t expect the complex will significantly compound traffic in the area but says planners will look at measures to alleviate the problem like turning the nearby dead end Blair Street into a through street. Luke Garrott, councilman for District 4 where the site for the proposed complex lies, is optimistic about the complex’s ability to reinvigorate the neighborhood. “We want mixed-use there,” Garrott says. “The problem is it’s almost just a single-use: office.” Garrott says the area has been locked into a kind of office district anyway since the ’70s, when the buildings currently located there were built. Changing that development mindset may just require the kind of attention that has been focused on the area because of the public-safety complex. “I think with the massive public investment [in the complex], we’ll also be sparking massive public interest,” Garrott says, noting the council has already appropriated $70,000 for the creation of a small-area land-use plan for the complex and the surrounding blocks.